No child is born in sin and needs no cleansing from guilt, past or present, as it enters the world. 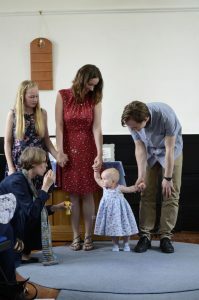 The word ‘Christening’ means to make ‘Christian’, and adults who are strongly conscious of the vows they make may not wish to promise the very young to a faith as yet unknown to them. Unitarians honour a Christian heritage but reject the idea of ‘Original Sin’ and its negative implications. When a new life is celebrated in a Unitarian church, we affirm the inherent worth of that person and his or her potential for making a difference in the world. Any notion of inherited sinfulness or institutional authority over this life is alien to our way of thinking and acting. You can welcome someone into your family circle with a simple church service, giving the new union its fullest meaning. Formalising a new family relationship in this way can be very meaningful for an older child and can help her or him to deal with the difficult adjustments they have to make. The open exchange of promises and hopes will help a child to understand that the care of his or her future is being undertaken in love and awareness, and that she or he is an important participant in events and outcomes. If you are interested in arranging a naming and blessing service (or adoption service) for your child, please contact us.